A couple years ago, I had the opportunity to test drive a few BMW models back to back on a closed course in BMW’s attempt to convince me to buy one of their models. However, I don’t have $35,000+ or to spend on the cheapest 3-series or $100,000 on an M5, so I just went to their event for fun at BMW’s expense. Performance – Both of these cars use a 3.0L Twin Turbo I6 engine but that is where the similarities end for the engines. The different types of fuels that the engines use give them completely different driving characteristics. It’s like comparing Barak Obama and George W. Bush. You expect a certain amount of performance from the gasoline engine (and it delivers) but the performance from the diesel engine just surprises you how violent and aggressive it is. The gasoline engine has 302 hp and 295 lb-ft of torque which is sensible for a BMW, there is a bit of turbo lag but it’s hardly noticeable unless you’ve driven a wide range of turbocharged cars. The engine provides constant power throughout the rev range and the 6 speed manual that the test car was equipped with was smooth but the shifter itself felt a bit “mushy” as in not as precise as I would expect it to be from “The Ultimate Driving Machine”. The diesel on the other hand caught me with my pants around my ankles. As soon as I planted my foot to the floor to take off from a dead stop, the traction control was constantly interfering through 1st and 2nd gears. The turbo lag was the same in the diesel version but more of the engines power came sooner at the lower rpms than it did in the gasoline car. This surge in power is thanks to the characteristics of diesels which can deliver almost all of the engine’s torque at rpms as low as 1000rpm. This particular engine can produce 265 hp but more importantly it can produce 425 lb-ft of torque (full torque) at just 1750rpm. This torque figure is what makes the car give you backlash when setting off and it’s what provides instantaneous acceleration when overtaking someone on the highway. Also this engine is not only powerful but it’s also … somewhat economical with 44mpg on a highway and 25mpg in a city. This diesel engine is one of my favorite engines of all time. In terms of handling and braking, both cars are identical, since obviously the only difference between the two are the engines. 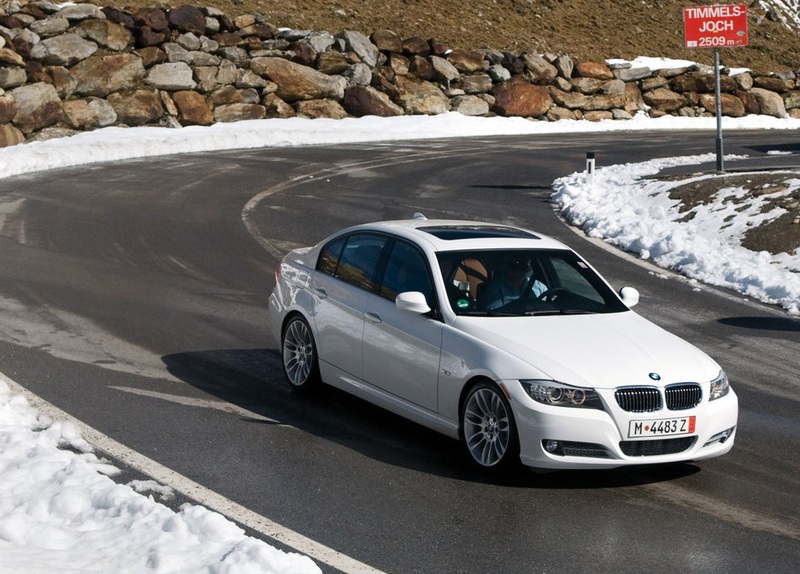 Driving through the slalom course, the body had very little roll and the steering was very responsive. 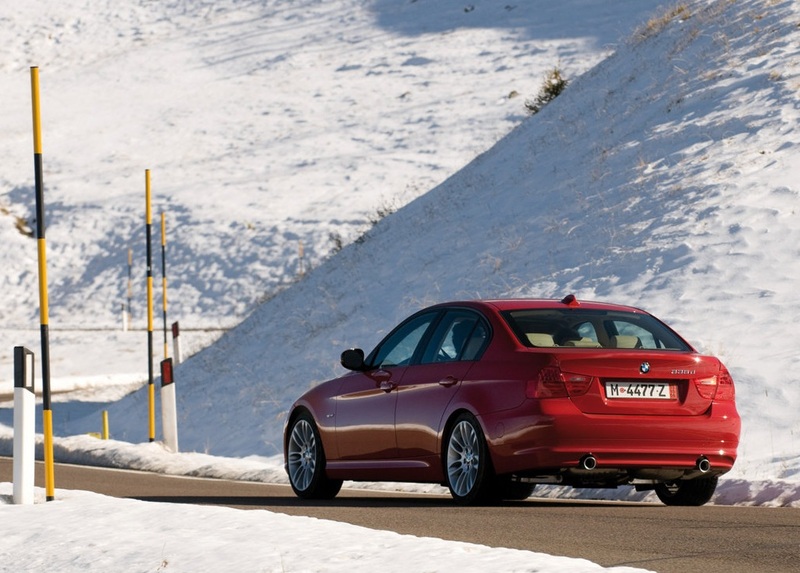 Handling is where almost all BMW made vehicles shine, it’s what they’re made to do best. Comfort – The interior is typical BMW, dead expensive cow skin everywhere. The dash looks similar to the previous generation 3 series but it has a concave layout that I don’t really like and understand. I’m one of those people who believe that all the controls should be positioned towards the driver, like the Mk.4 Toyota Supra. Unfortunately at the closed course that I was on, there weren’t very many bumps but of the few that were, the ride felt a bit harsh and firm, most likely due to the fact that it had run flat tires which BMW is obsessed with. Overall, it’s a spacious interior and it has comfortable seats but it just doesn’t feel like it’s a very driver orientated interior dash, again something that I wasn’t expecting from “The Ultimate Driving Machine”. Odds and Ends – Is it just me or is BMW styling just getting more and more bland? Apart from the twin exhaust pipes and the badge, you can’t really tell that this is a car that is just as fast as the previous generation M3 and it just doesn’t stand out in a parking lot as a $50,000 car.